A couple who stopped by the museum asking Karen to assess rocks they’d found were a bit disappointed when she said there were no agates among them. In a post a year ago today I told you that the Agate Lady Rocks. 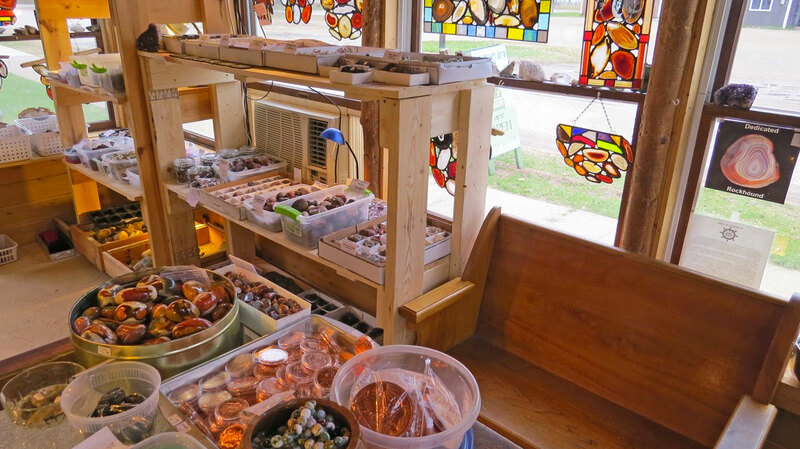 Karen Brzys, an expert on the semi-precious gemstones, owns the Gitche Gumee Agate and History Museum in Grand Marais on the Upper Peninsula’s Lake Superior shore. She’s still rockin’. Both books help you to “think like an agate,” the approach she uses in guiding rockhounds on successful hunts. The new book carries 265 diagrams and color photos by expert mineral photographer Tom Shearer of Duluth, Minnesota. I haven’t seen it yet but my brother Dennis thumbed through a sample copy on a recent visit to the museum and gives it high marks. The shipment of books is due to arrive by the end of June and will be available at the museum, online and at gift and rock shops and bookstores. In addition to researching and writing books Karen makes “mineral art” that she sells in her museum shop and at art shows. And this summer she’s offering a lecture series on Lake Superior agates at 7 p.m. every July and August evening. The programs will be held in the “corral theater” on the museum grounds and admission is by donation. A sample of Karen’s stained glass-like “mineral art.” She also makes beautiful desktop accessories, nightlights, lamps and more.